The Season Opening of theTeatro Regio di Torino will not take place . In light of the state of emergency declared in the Piedmont Region, the opening night of the 2000/2001 opera season that should have taken place this evening at 20:30 with the performance of the opera, Sly has been cancelled. The opera will be performed on Thursday, 19 October at 20:30 with Turno B. The theatre's management is looking into the possibility of rescheduling the cancelled performance in November. The performance tonight, cancelled on Monday symbolically represents Torino's return to normality. The emergency is there, only barely behind its shoulders, but the city is slowly returning to a normal life that had been swept away by water. A sign of this "normalization" comes from the world of the theatre and other performance venues. To be sure, this sector has not suffered physical damage, but it has had to adapt its schedules based on news from "war bulletins". And if, for some, what counts is the number one rule of the theatre "The show must go on" , and its perhaps more cynical variaiant "A debut with rain, is a lucky debut" ("debutto bagnato, debutto fortunato"), others have maintained that it was more fitting to dim the lights and not raise curtains. And this is what happened, first of all, at the Regio, where on Monday evening the management didn't feel it right to open the 2000/2001 opera season and cancelled the performance. Instead, it will take place tonight at 8:30 pm, beneath what we hope will finally be a starry sky. 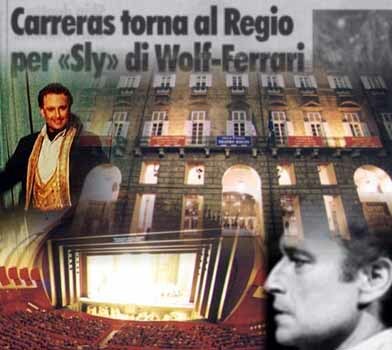 The title of the performance is Sly, or the legend of the sleeper awakened by Ermanno Wolf Ferrari, while the star of the evening will be Jose Carreras who returns to the stage of the Regio after years of absence: his last appearances were in '91, for a concert celebrating the 250th anniversary of the theatre and in '93, for the launch of the [Fiat] Punto [another concert]. Tonight, the Catalan tenor will interpret the poet, Sly, the protagonist of the opera composed by the Venetian musician in 1927 and inspired as much by A Thousand and One Nights as by the Prologue to Shakespeare's The Taming of the Shrew. It will be a true and real artistic test for Carreras, playing a character who requires great dramatic gifts and changes of style from the comic to the tragic. A long stop in front of the mummies that Drovetti had brought to Turin. A glance at the Sphinx of Karnac. And a close examination of the miniscule drawings in the "The Book of the Dead", the longest papyrus in existance. 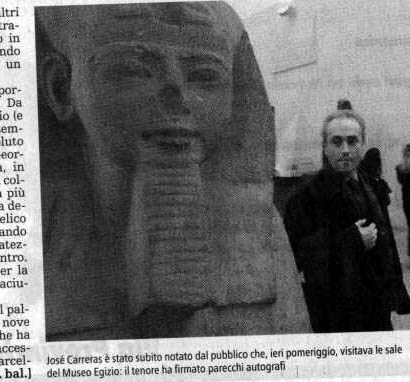 While waiting to opean the new season at the Teatro Regio (next Monday in Ermanno Wolf-Ferrari's "Sly, the legend of the sleeper awakened", the Catalan tenor José Carreras allowed himself an afternoon of relaxtion in the austere rooms of the Egyptian Museum. Despite the leaden sky and a climate like London in the autumn, Carreras arrived at the Academy of Sciences on foot after a brief stroll from the Sitea Hotel. «We tenors like damp weather - he joked in perfect Italian - it's good for the voice. It's when there is too much sun that we start to worry." In the entrance hall of the museum, by coincidence, he ran into a party of Catalan tourists, tranquil middle-aged people, who after a moment of shyness, greeted him like a pop star: shaking his hand, autographs, photos. In the company of several artists from the Zurich Opernhaus and his friend/manager, Mario Dradi, who is passionate about archeology, the Catalan tenor then ventured into the Egyptian rooms. "He's a true gentleman a staff member of the Teatro Regio confided to me - very few of his colleagues would have passed a free afternoon walking around the streets of the city center like an ordinary tourist"
But Carreras likes to live like a normal person. For example, a passionate football lover (and Barcelona fan), Wednesday evening, he wanted to watch the Italy vs. Georgia game in a salon at the Sitea, in the company of some of his young colleagues. And to make the evening even more fun, he decided to offer his guests a Pantagruelesque [Pantagruel, one of Rabelais' characters, was a gigantic gourmet] snack, having gone in person to buy treats from the delicatessens in the city center. For the record, he wasn't very impressed by the Italian team's game. José Carreras returns to the Teatro Regio's stage after nine years in a production which has scored a notable success with the critics and the public in Barcelona and Zurich. Let's talk a bit about Sly, when did you first discover this opera that is so little known to the public? "I discovered it in Milan in 1985: Cesare Mazzonis gave me the score because he wanted to put it on at La Scala several years later, but then I went through a very hard period, a bit difficult, I was out of commission for a year (Carreras always speaks with great serenity and great strength about the illness, leukemia, which struck him in 1987, and from which he is now completely recovered.) and so that project was cancelled. But I have always kept the idea of singing it because I find it a fascinating role for a tenor. It has extraordinary possibilities, both vocally and dramatically and so finally, 3 years ago in Zurich, I made my debut in this opera and then also sang it in Barcelona and Washington. Now I'm performing it here in Turin and during the run in Turin, we will take it to the Acropolis in Nice for two nights. Then I will be performing it at the Metropolitan, alternating with my friend, Domingo. All in all, it was worth it to re-discover this opera that seems to be a big hit with the public"
Sly is a poet, a drunk, a man who says that 'life is beautiful' if he has a woman to love. For you, who is Sly? "He is all those things, but he is also a sensitive man, an artist, a profound man, a tramp who manages to inspire emotion in all the other characters, even if they are also drunks. It is he who inspires the others. He has a great sensitivity. Sure, he's a loser but he has an extraordinary human authority. I'm not a musicologist and I don't want to appear arrogant by passing judgements, but this remains a very Italianate opera with a clamorously thrilling ['strepitoso'] third act. Strepitoso is a word that my friend, Luciano Pavarotti taught me: every time we had dinner together, he would pass me a slice of salami and say that it was strepitoso". The three tenors, the three friends, will they continue to sing together? "Yes, in December we three 'salamis' will see each other again in a big Christmas concert in Chicago. Then in 2001 we have already scheduled three concerts for Japan, Korea, and the USA.". Did the friendship and affection of your fans play a fundamental role during your illness? "Yes, absolutely. In those moments to feel your family near you, your friends, and so many people that you have never even met but who love you and show it, is extremely important. It certainly help be a great deal to conquer my illness. Experiences like that make you more mature, they change you, they make you reconsider your values. Right after you have won the battle, you feel yourself to be wiser, more good, more tolerant. Then you start to live life again, you feel well, and because you are only human, you start making certain mistakes all over again. But you don't lose the maturity that you achieved, above all when you have learned that the most important things are dialogue with others, tolerance, and seeking to understand each other.". There are entire sites on the internet dedicated to you, legions of fans who exchange information on what your favourite sandwich is, or your next role. Do you ever navigate the web to your site? "My favourite sandwich is a variation on the sandwich we make in Catalonia, that I think is rather similar to the Italian 'panzanella': some tomato on a slice of bread, a bit of oil, and then I add a very thin slice of parmigiano. But the recipe aside, I have to confess that I have never surfed the internet. A year ago, my two children, Albert, a lawyer in Geneva and Julia, who studies at the university in Barcelona gave me a portable computer, but I've never had the time to use it, not for email nor for the internet: I'm a bit afraid of this challenge.". What memories do you have of Torino? "I have often sung here, at the Rai Auditorium Rai and at the Regio, beginning with Luisa Miller in 1976 to Werther with Lucia Valentini Terrani and in this theatre I have always been welcomed with great warmth and affection. I am comfortable here because I have always found a very serious professionalism". "True, Sly is a tramp, a man of the taverns, a drunk, but he is also a poet, more sensitive and profound than he seems. I think that the librettist, Forzano, and Wolf-Ferrari's music have captured him very well: he is also a most fascinating character for a tenor, because he is not the usual romantic character, he is also a loser." Here he is, with us again, Jose Carreras, ready to open the season at the Regio with Sly, the neglected 20th century opera by the German/Italian Wolf-Ferrari, which, in fact, thanks to Carreras, has found its way back onto the stages of Europe. The Zurich production is now in Turin "a city that I find stupendous. Yesterday, I was at the Egyptian Museum and I was able to admire the great work done by Schiaparelli. And then, the Regio has always been one of the theatres in Italy and in Europe where work is carried out seriously and professionally, where I have always found great affection back to '76 when I came here for Verdi's Luisa Miller and then again in '80, for Massenet's Werther with poor Lucia Valentini Terrani, who is no longer with us. [The famous Italian mezzo-soprano died last year of leukemia]. But before that, I had also been to the RAI auditorium which represents a significant part in the musical tradition of Turin: there I also sang rare works like Donizetti's Caterina Cornaro"
For Carreras opera seasons should always be devised to combine famous operas with rare ones, as the Regio has done by looking into the undiscovered 20th century works: "We need to give space to contemporary works so that the public can finally come to know them." Now we even hear Sly more often, including another production by Marta Domingo from Washington which will be performed at the New York Metropolitan in 2002 with Placido Domingo and Carreras himself alternating the role of the protagonist. Judging a production in which he is singing always remains difficult for Carreras because while working in it, he believes in it. As for the Hollmann production which has now been brought to Turin... "I believe in it a lot. I find it modern but not too avant-garde, respectful of the music, of the singers and of the public, I think it captures very well the spirit of the opera, which may not have the quality of those by other composers, but knows how to reach the audience." Modern but not too avant-garde could also be a definition of Wolf-Ferrari's style: "That is a judgement that prefer to leave to the musicologists, I am only the interpreter. However, as an interpreter I can say that, despite the strong 'Mittel Europa' influence that can be seen in Wolf-Ferrari's music, Sly is a very Italianate role, very evident in the clamorously thrilling ['strepitosi'] moments of the third act." He then adds: "Strepitoso is a word that I learned from Pavarotti. Every time that he gave me a slice of salami, he would say to me 'It's strepitoso.'". rapport they have established. It is the kind of attachment to life of someone who has overcome leukemia, who wishes to put it behind him while at the same time not forgetting to help those who suffer from it through the Carreras Foundation. This too signifies a great personality, one which in music serves to bring Sly to life, the character who for the first time in 1927 had the voice of Aureliano Pertile. "Magnificat": famous voices and a composition by Morricone. Many years have passed since Ennio Morricone and Franco Migliacci worked on the careers of Rita Pavone and Gianni Morandi [Rita Pavone and Gianni Morandi are both Italian pop stars, whose heyday was in the 1960's and early 70's. Morricone is also famous for his haunting theme music in Clint Eastwood's 'spaghetti westerns'] so many that today it seems extraordinary to find them together in a project with an entirely different profile: the composition of the "Cantico del Giubileo". Migliacci worked on the lyrics with G.L. Zenga, the originator of the "Magnificat" project while Morricone did the music with M.Cantini. It is the "Cantico del Giubileo", a solemn composition by Morricone, that opens "Magnificat", a celebratory cd presented yesterday to raise money for building family houses for disabled people who cannot live on their own. The initiative presents classics of music with a religious theme, interpreted by celebrated voices like José Carreras (Franck's "Panis Angelicus" and Stradella's "Abbi pietà di me"), Montserrat Caballé (The "Ave Maria" from "Otello"), Renato Bruson ("Benedictus" by Mascagni) and Pietro Ballo ("Ave Maria" by Gounod). The project was born to support the battle by Anthai, an association that cares for the disabled and which on Sunday will be selling "Magnificat" in all the piazzas of Italy to raise funds. "where art can be a life-renewing consolation. Even if he, with his great discretion, doesn't like to talk about it, Carreras has won his personal battle against death. And he is one who truly knows what it means when life triumphs. Perhaps also because of this, there was such convinced applause." "gave a double gift to Turin. He appeared on the for the first time after a long absence in the role of Sly which requires a great interpretive versatility. And it appears that he will available on November 30th to make up the cancelled 16 October performance." "There he was on the stage, José Carreras in full vocal form with his ringing timbre and the naturalness of a good actor." [...] the opera with its private grief ("sono un povero uomo che soffre e ha sempre pianto da solo - I am a poor man who suffers and has always wept alone" sings Sly in the final tragic self-portrait) comes alive, above all, in the strength given to the portrayal of the 'defeated' protagonist. 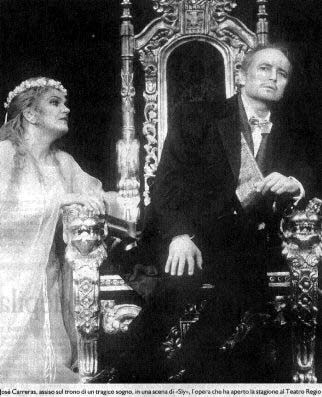 As in 1998 in Zurich, where this production was born [...] José Carreras who has regained his declamatory powers and conveyed powerful emotion, even if he was a bit 'sparing' with his vocal coloring hit the mark as the protagonist. The Teatro Regio production of Sly was also reviewed by smaller papers in Milan, and Genoa. Unlike most of the first night reviews in La Stampa (Turin), but like the Corriere della Sera (Milan) these local papers tended to give more attention to the actual voices. [...] The rehabilitation of Sly travels with some luggage that has a luminous effectiveness Carreras, to be exact. This highly praised interpreter who has already rehabilitated the opera in Zurich and Barcelona before his 'third encore' in Turin, seems to wish to wear only Sly's clothes at the moment. Now, Carreras is worth a Sly, one should try to make friends with it. Certainly my direct impression Sly is not worthy of this Carreras, who gives to Sly a rounded tenor voice (minimal flaws when [the voice] is stretched), full of nuances, wonderful in the shaping of its timbre, combined with an intelligence of phrasing. It is impossible for him to 'go overboard'. As for the rest, in this opera, 'going overboard' in the performance, especially for the protagonist, would be a complete mistake. In fact, it would render ridiculous the few emotional tensions that there are. [...] It is better to limit ourselves to admire, apart from the splendid work of Carreras, the moving dedication of the soprano Elisabete Matos, the robust figures of the baritones, Carmelo Corrado Caruso and Enrico Marrucco, the competence of the cast and chorus, and Renato Palumbo's incisive style of conducting. [...] The singers rose perfectly to the arduous task set by Wolf-Ferrari in his score; in a drama like this, constructed in such a way that even one person out of place, in terms of voice, diction, or accent, could have threatened the entire structure. The cast was up their assignment. Josè Carreras wore Sly's clothes sincerely, more than just convincingly passionately. He threw himself generously into the fray from his very first entrance. He sustained the first part of the third act, and with the powerful Elisabete Matos the second part as well. The third act ends with his death the end of the drama. The two excellent baritones should also be singled out [...] The opera will be performed until the 16th of November and truly deserves to be seen. [...] Carreras slips into this role, which is more difficult than inaccessible, like a hand into a glove. He dominates the stage, showing his vocal muscles yet also unveiling a series of "mezze voci" with the timbre and rich resonance that one hears only in great singers [...] For Carreras an unqualified success. For Sly much applause. [...] the great Carreras, who usually avoids the tiring post-performance rites, came out of his dressing room still dressed in the tragic clothes of Sly the poet tramp, tricked unto death to greet the Piedmontese dignitaries. "Maestro, you were magnificent, I would be honored to invite you to dinner in Turin" said Castellani. The great tenor quipped "Sure, maybe we can watch the Juventus/Barcelona match together." Standing out in the midst of group of people in evening dress, the torture of autographing programs began for Carreras. But it doesn't last very long. José-Sly is truly tired. After 5 minutes he returns to his dressing room and then is off to the Hotel Negresco. He has to catch a plane very early the next morning. Instead, no timetable problems for Gian Carlo Del Monaco who, despite the heavy criticism in the Nice-Matin the previous day for having incurred excessive running expenses at the Opera de Nice (recognizing, however, that he deserves credit for bringing names like Carreras to Nice), took big puffs of his Havana cigar and declared himself ready to form a "stable and long-term collaboration" with the Teatro Regio.